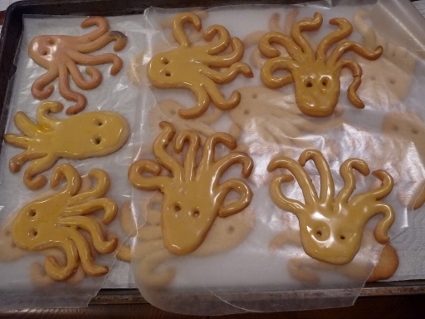 20,000 Leagues Under the Sea Cookies! I have a good friends who every few months have “Movie Night” at their house. It’s well organized as he does themes for the year and usually starts with some interesting information about the film that I never knew. The folks who come are all interesting to talk to as most are interested in culture; there’s a few retired professors from the local University and even some that come down from Canada just to attend! Use waxed paper between layers. 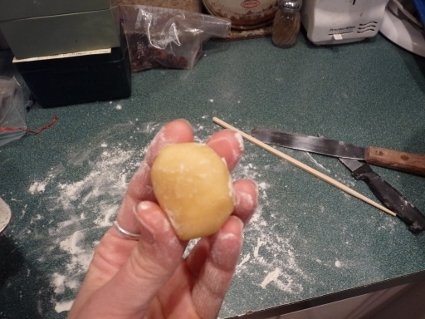 It’s a basic Butter Cookie dough that I’ve used for cut out cookies, and you can too. 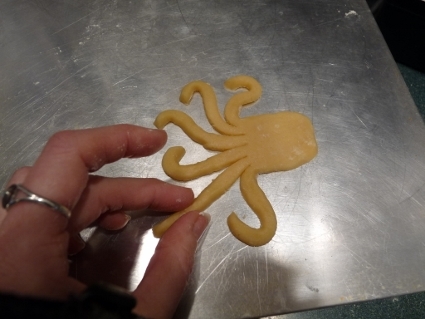 But you can also play around with the dough as I did and shape them by hand. I’ll give you tips under each photo that will help you make them successfully. I do hope you try them or at least creating something then let me know how it went for you. To glaze the cookies wait until they are totally cool, this insures less breakage when you handle them. Make a drippy glaze in a cup by putting about 1/2 c confectioner’s sugar in then drizzle in some vanilla (I didn’t measure, just don’t overdo it) maybe about 1 tsp or so, and start mixing; now add a drizzle of milk, just a tad! Mix it up and you’ll be surprised at how little milk will make it runny. You want it sort of runny so it glazes easier. Add a drop or so of food coloring and mix. Using a spoon gently touch the cookie as you let glaze drizzle out, I keep contact with the spoon and it helps to guide the glaze where you want it to go. Don’t put so much that it runs down the sides only because it’ll make it harder to move them without breaking tentacles later! 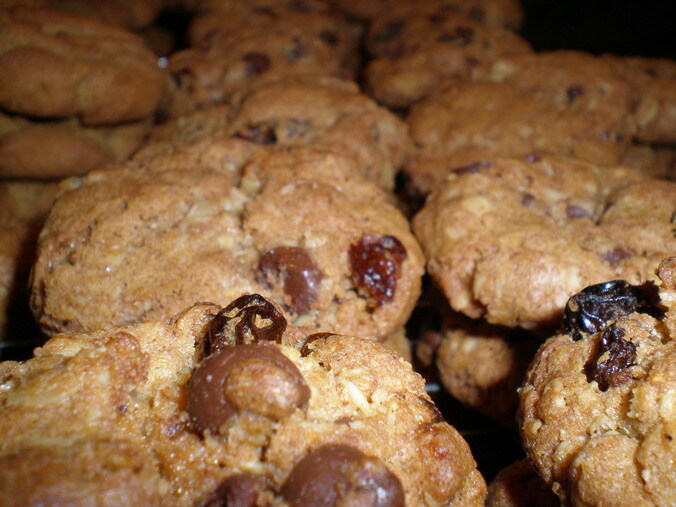 Besides glazing you can leave the cookies plain or dust with confectioner’s sugar. With any you can still taste the yummy goodness of this basic butter cookie. My favorite part was nibbling off the tentacles! 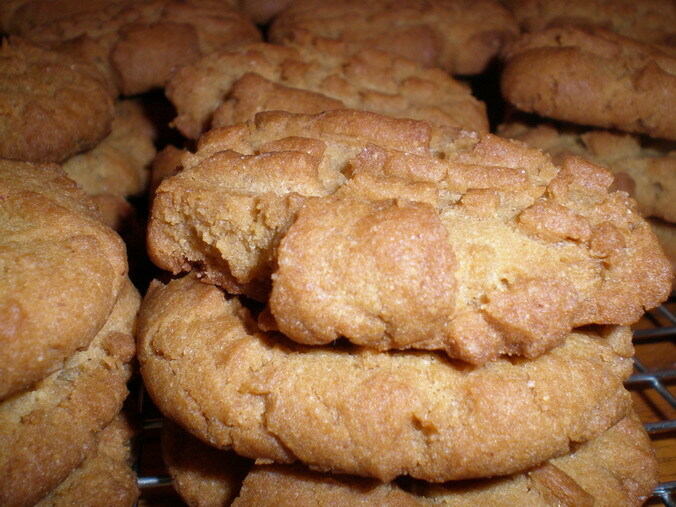 They are crispy golden and when you pick up a cookie it’s the first thing you want to eat! How fun! If the cookies aren’t too ‘detailed’ you can also brush with egg white and sprinkle with colored sugar then bake; this is usually what I do for cut outs. 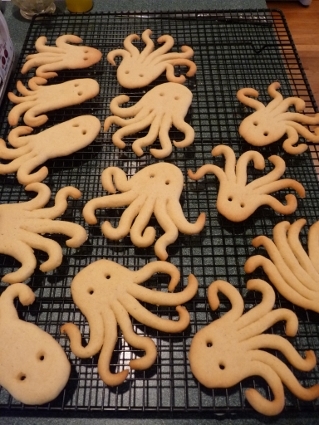 whoa...a whole bunch of squid monsters! These are cooling from the oven…can you see how each one is different? This is what makes them so fun. Now my boyfriend saw them and said if you look at them upside down, they could be a Medusa head! Oh…what a fun idea! Can you picture it? So, onto the cookies! I’ll put the recipe here then below pictures with detailed explanation and tips. 1. Preheat oven to 350F / 180C. 2. Cream butter and sugar well. 3. Beat in the egg and vanilla. 4. Sift the flour, measure and add a bit at a time mixing in well each time. 5. On floured surface roll dough out and cut with cookie cutters. Lift the dough and move it around a bit and re-flour if needed before you cut out, this way they don’t stick to the counter as much. Or just follow my directions below to hand shape them. 6. Bake on ungreased cookie sheet 8-10 minutes depending on their size, look for edges to get golden . 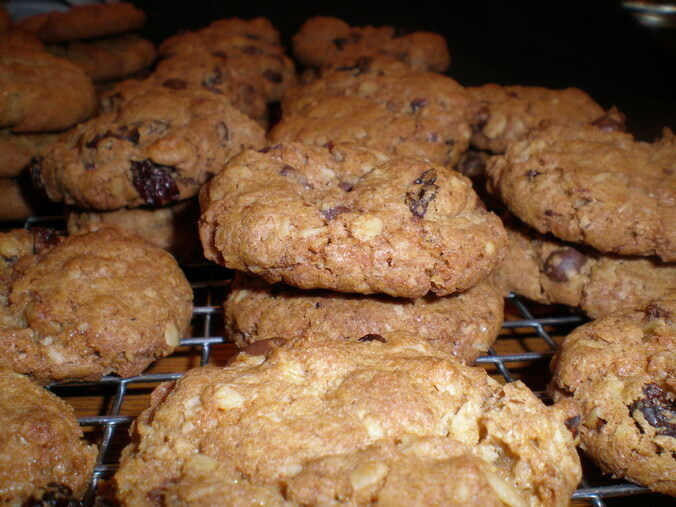 For shaped cookies, let them cool for 3 minutes on the pan before removing them. 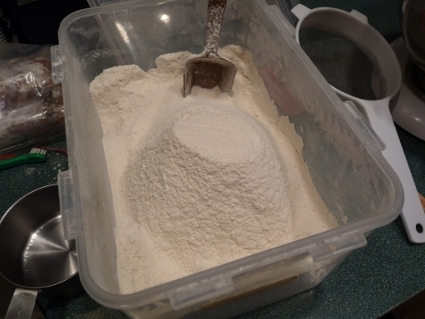 I’m pretty laze about sifting flour first for recipes, especially cookies, but for this one it says ‘sifted flour’ so I just sifted a pile into my container then gently scooped up to measure. 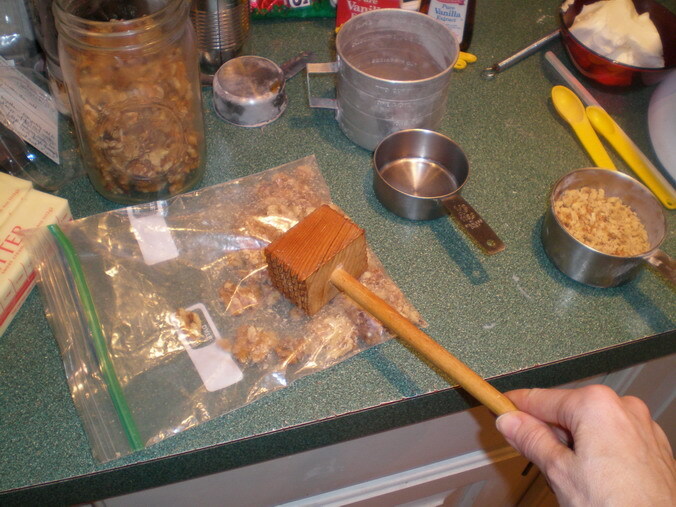 I then sifted more and repeated until I had enough, it wasn’t a big deal to do it this way. Ok, so first step is to start with a walnut sized ball. See how my hands are floury and the ball slightly floury? That’s how you want it, NOT sticky. Roll the ball into a log with your hands, if it feels at all sticky, just dust your hands with flour again or roll the log on the counter to pick up flour then roll it in your hands and the flour will disappear. It shouldn’t feel sticky is the point. On a floured counter pat it out into an oblong shape making it wider at one end. Now place the log on the floured counter and using your finger tips gently pat it out flat. You will coax it into shape by patting flat with fingers of one hand while the other hand will push the edge to make it into a shape. Like here my left hand is keeping the bottom from spreading and the dough will go wider as I press with my right hand (fingers). Of course I’m holding the camera so you can’t see it in action! You can see it looks a bit squareish on the right, I then used my fingers to push it in and round it. Cut in the middle leaving 1/3 uncut. 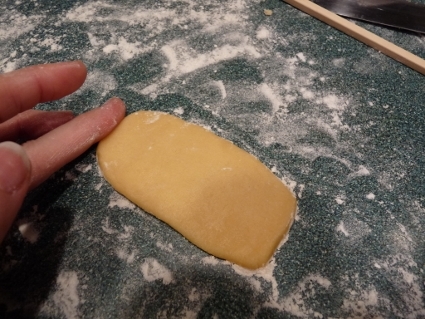 Lift the piece of dough and lay it near the edge of the ‘floured’ counter like so. It helps to lift with an icing spatula, you can see mine in the picture above showing the ball of dough. 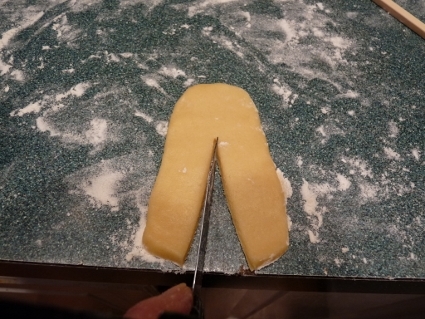 Take a sharp knife or use the edge of the spatula to cut the dough up the middle, cut 2/3 up. The top is the head so how ever long your shape is will determine how long the tentacles are. You’re going to cut each side into three parts, just keep the dough straight and make two cuts. BUT first! Here is the important tip!! When you cut, the dough will want to stick to your knife. As you lift it out, lift from the handle first in a rocking motion so the dough falls away from the knife and won’t pull on the dough near the tip of the knife. 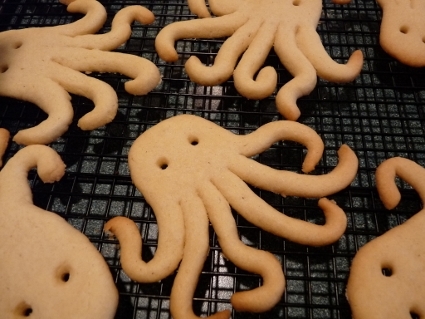 This is important because the trickiest part of making these is not pulling the tentacles off! 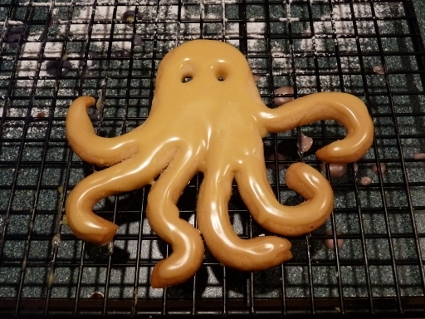 You don’t want to ever pull the dough at the base of the tentacles, you’ll see what I mean when you do it. Wipe the blade off between cuts and use some flour on it if you want. 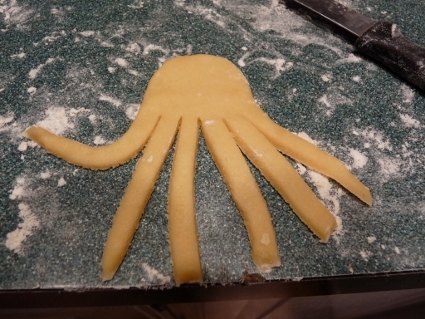 Six tentacles for a squid, but I don't think it matters, they are what you tell people they are, squid or octopus! It’s really not that hard once you start doing them. Use your icing spatula to help you lift the head then it’s easy to get your fingers under and lift the whole thing up. Gently lay on an ungreased cookie sheet. I put four on each sheet only because while some were baking I’d be working on them and it’s hard to get more done than that. 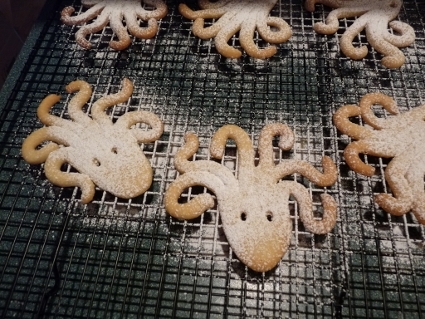 Gently pinch tentacles to make them more rounded. 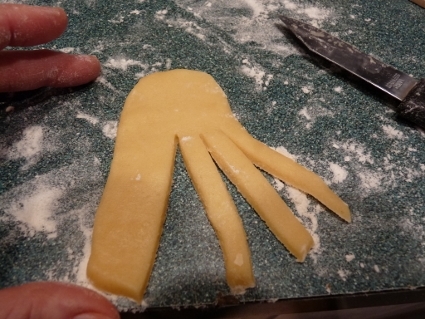 After you lay it on the COOLED sheet, start with the outer legs and gently round each tentacle by lightly pinching with your fingertips then curve them up by the head. Then you do the rest of the legs being careful always not to pull on the legs at all. Make eye holes with the end of a chop stick. Use a pointed end of a chopstick or something similar to make holes for eyes. Stick it into the dough then make a circular motion to push the dough aside and create a hole, don’t make it too small or it’ll puff shut when you bake it. 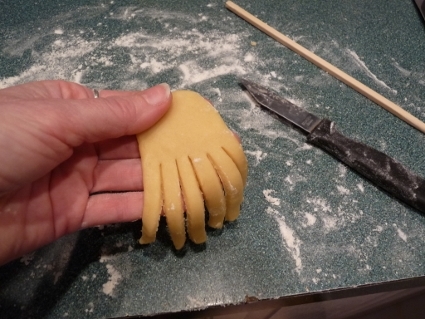 I found it helpful to hold the dough in place with the other hand while doing it. 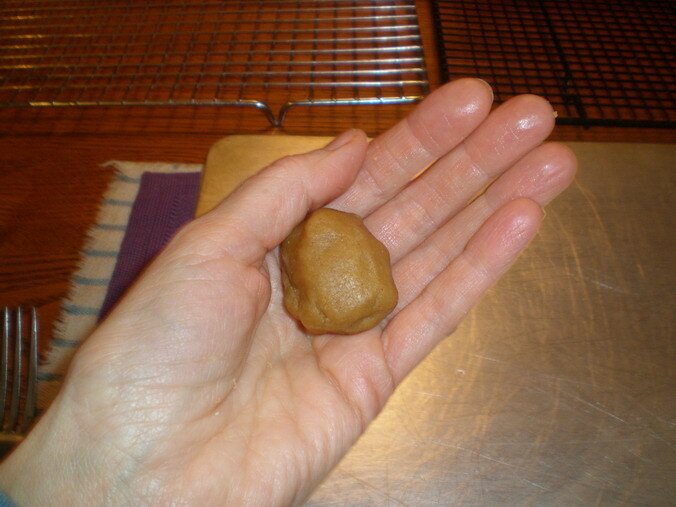 Do one cookie start to finish because the dough may get sticky if you let it sit on the cookie sheet waiting. Put them in the oven for 8-10 minutes, mine took 10. 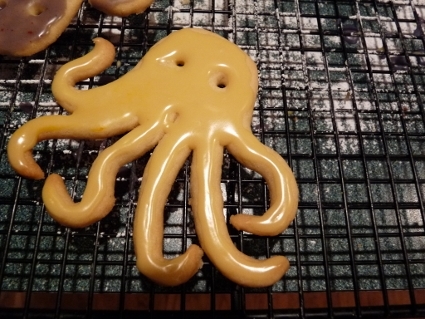 Check to see if they are golden on the tips of the tentacles, give the cookie sheet a turn when you check them for even baking. When you remove them from the oven, set the timer for three minutes and let the cookies cool for that long. I found they were cooled enough to let them slide off easily but still just warm enough that they didn’t want to stick to the pan. 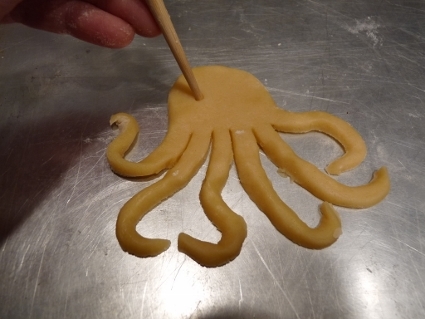 Use the icing spatula to lift them off, making sure first that every tentacle etc is loose. I hope you’ll try to make something with this dough and let me know! I’ve even used it at Christmas or St. Patrick’s Day by tinting some of the dough then making striped candy canes or shamrocks….hm…I may have to make them again just so I can photograph them and show you. Click the picture below to see the recipe and photos as a glossy note card you can send or keep! Are you planning on having a cookie exchange? 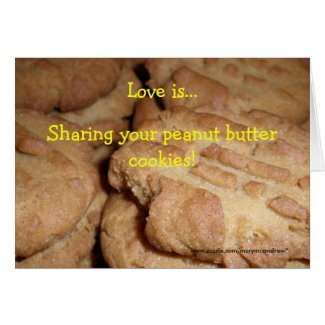 I created Invitations in my Zazzle shop that have pictures of “Grandma Judge’s Peanut Butter Cookies” on them and the cards look so cool it makes me want to have a Cookie Exchange! Here’s a link to see them, and a photo below. 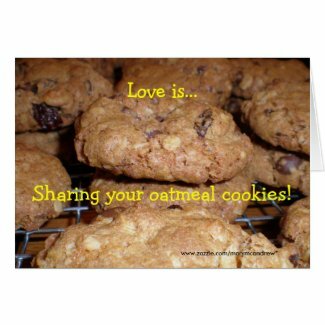 You can change the photo to one of your own cookies and all the text is ready for you to put in what you want, so easy! They come with envelopes and are printed on both sides. 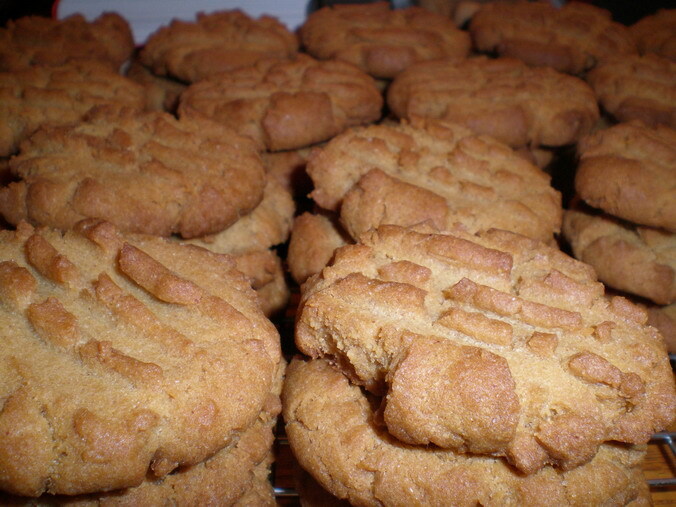 Nothing like stacks of home made peanut butter cookies! This has to be one of my favorite recipes, these cookies come out light and crispy and you’ll be grabbing a glass of cold milk to dunk them in before long. 1. Cream the shortening and sugars well, then add the eggs and vanilla. Mix well. 2. In another medium size bowl, put the flour, baking soda and salt and mix. I use a whisk to mix it together. Now add it to the creamed mixture. 3. Add the peanut butter and mix well. 4. 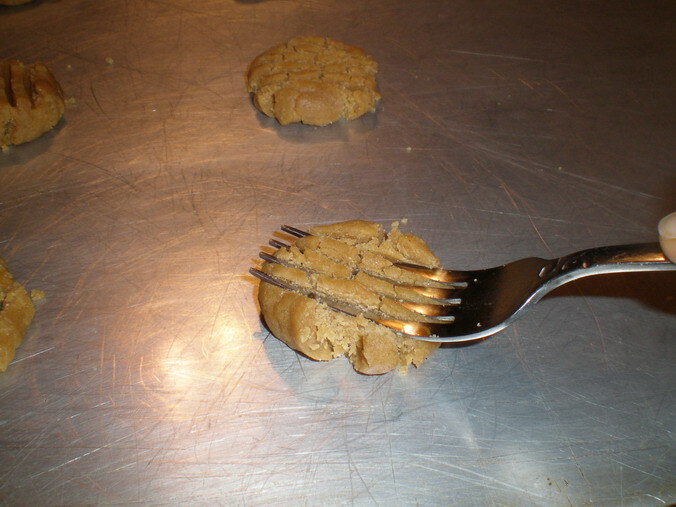 Put balls on ungreased cookie sheet and squish gently with a fork. 5. Bake at 375 degrees for 10-12 minutes. If the dough is a little dry, just kind of push the dough together more than roll it. Sometimes I put dough in the refrigerator to bake the next day, these will get just a bit dry but still work fine. Gently press with a fork after putting on the cookie sheet. 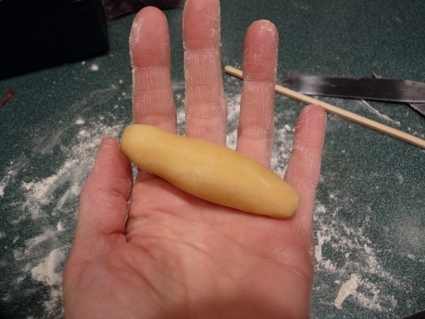 If the dough is a bit dry (see above) then you can use your fingers to gently press the sides of the dough in as you squish. Ahh…excuse me while I go pour that glass of cold milk! Click on the note card I created below, it has the recipe printed on it so you can cut it off and have a glossy photo recipe card! 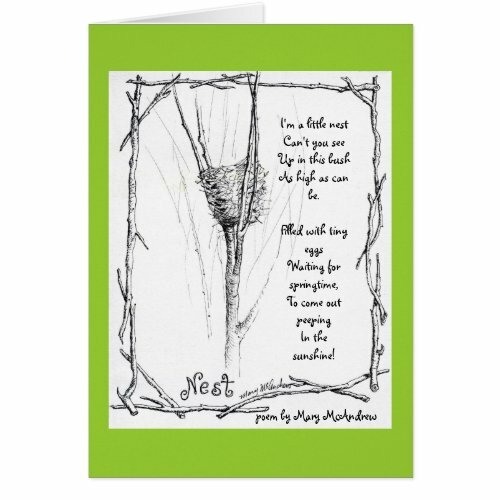 In my Zazzle shop. This is a recipe my mom made every year at Christmas and sometimes during the year because they were so popular with us; it was from her mom, my Grandma Judge. 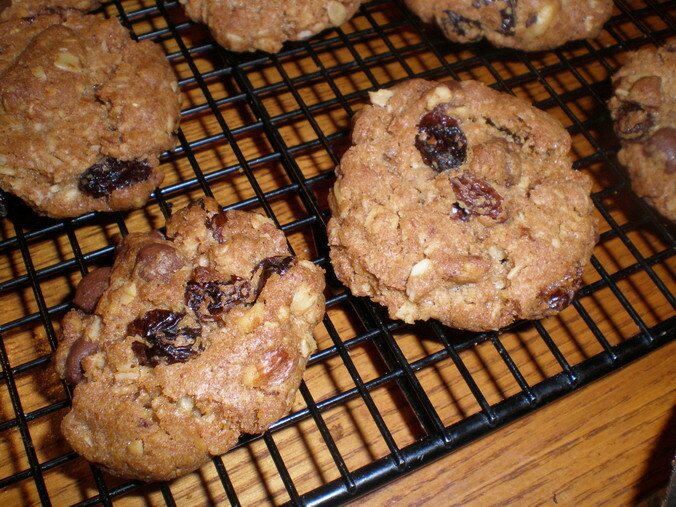 They are a light and crispy cookie that have several spices in them. My mom used the Quaker 5 minute oats but because I buy the whole rolled oats, I use that, they have a bit more texture but the same great taste. 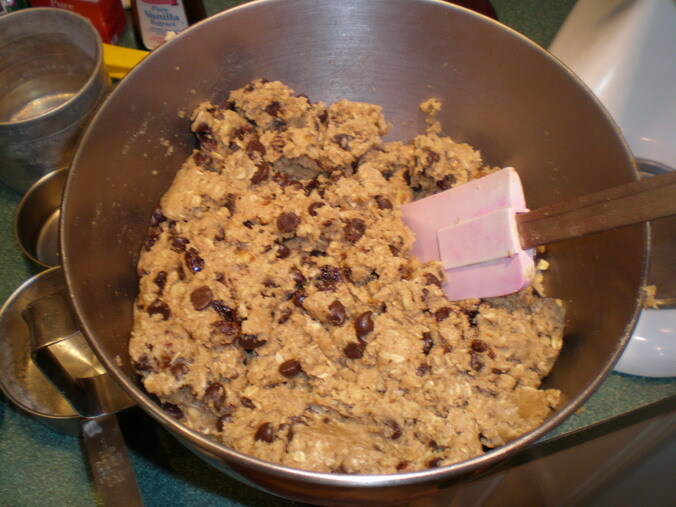 I also add chocolate chips to half of the dough because, well you know…gotta love chocolate chips! 2. 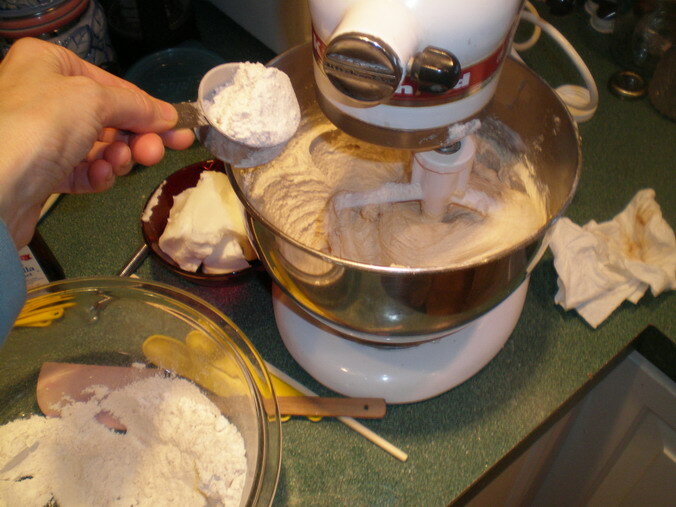 Put the sugars and shortening in mixer bowl and cream until fluffy. 3. 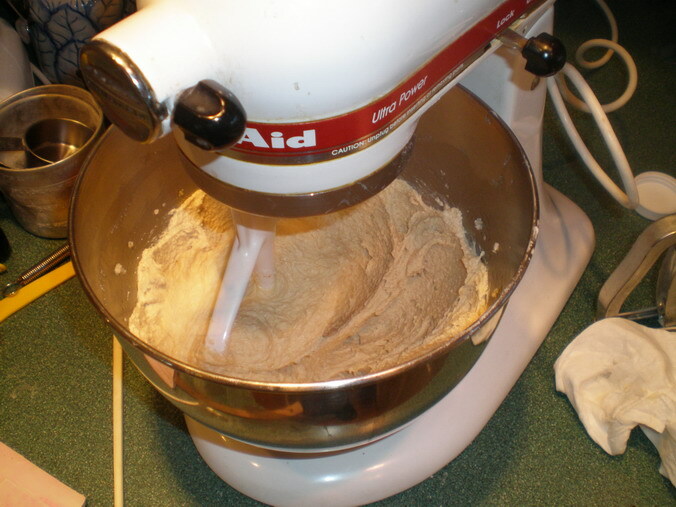 Set your flour sifter in a medium bowl, put the flour followed by the spices and powders into it and sift into the bowl. 4. Add the flour mixture to the creamed mixture using a small measuring cup, add some then let it mix in, add more, let it mix. Scrape down the dough sometimes from the sides of the bowl. Oh yes, do it on low so it doesn’t ‘puff’ out all over! 5. With mixer still on low, add oatmeal and mix well. 6. Add nuts and raisins and mix well. It’s a stiff dough and will climb up the bowl, tame the beast by pushing it back into the bowl. You can add those chips now, or wait and bake half this dough, then mix in some by hand to the remaining dough. 8. Bake 10-12 minutes. In my oven it takes 12 minutes. Then remove them with a spatula/pancake turner to cool on a rack. Click on any picture to see enlargement. Add a little at a time and let it mix well after each addition. oatmeal cookie dough filled with goodies! Time to call the munchkins in to eat ’em! Oops, they smelled them a long time ago and are already snitching some! 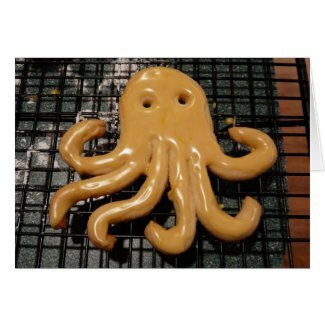 Click on the picture below to see a Note Card I created with the recipe printed on the back of the photo, you can cut it off and have a recipe card with a glossy photo! Great idea to send someone who loves to bake.